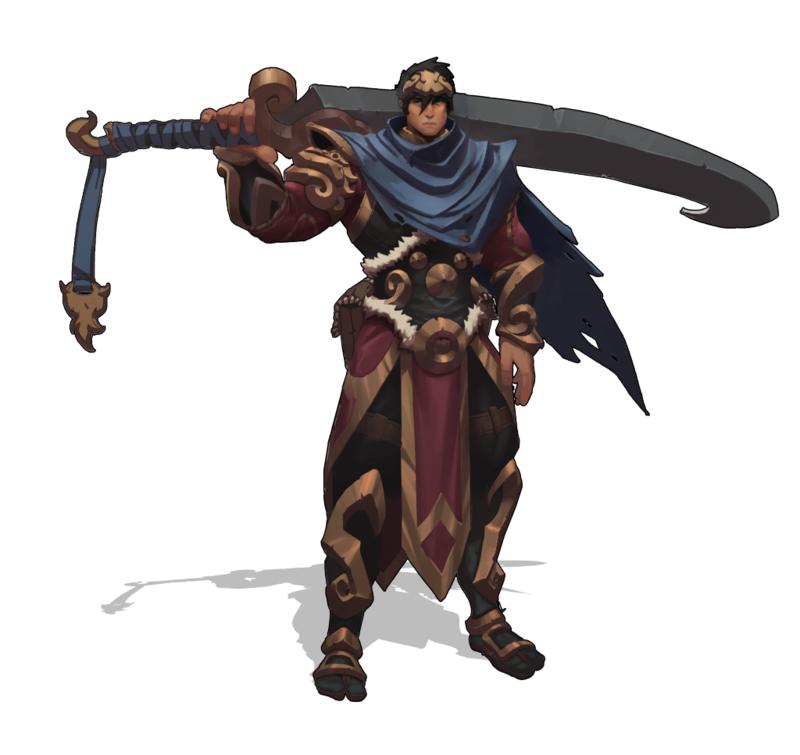 We also wanted new players, who might be starting out with Raigon, to learn some more of the common mechanics found in Battlerite. This would allow these newer players to carry on some knowledge from Raigon to their next champion of choice. 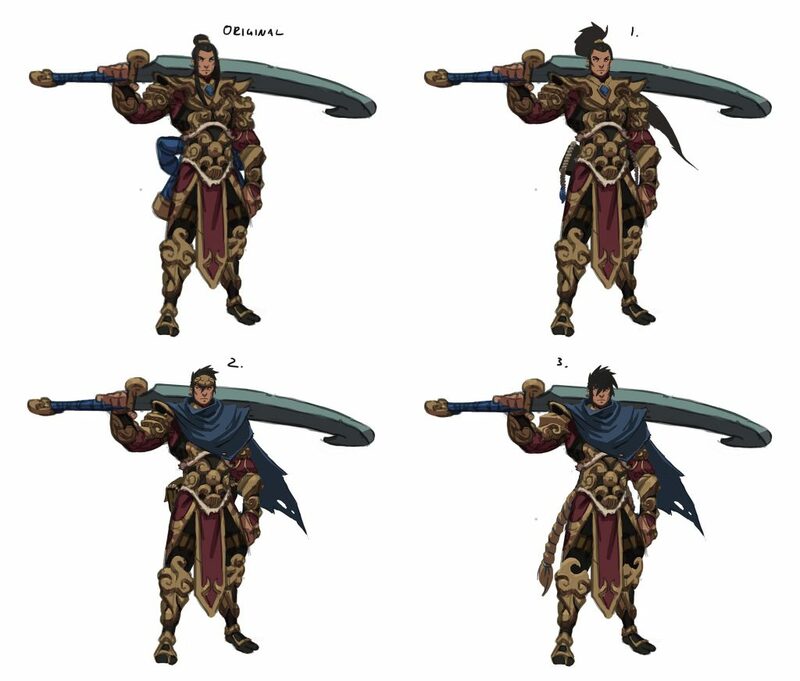 Allowing Raigon to regain health turned into the life leeching mechanic of Sword Slash and Retribution, after trying out several variations. Retribution in particular saw many different iterations. At first, it was a move where Raigon stood still. The idea of combining the move with some kind of mobility to make players able to also use it as a gap closer or a dodge/escape made for some interesting decision-making when we were playtesting. So we took the ability in a new direction. When designing the movement part of Retribution, we experimented with a teleportation move forward combined with the slash. At this point we felt that we were over complicating things for a couple of reasons. A teleportation would for example mean that Raigon would have to be unhittable during the move to match the visual representation. This would restrict the counterplay options and require players to be familiar with the range to be able to hit consistently. Not really what we wanted for this type of character. A mechanic that made the dash that is today more favorable was that Raigon would stop in his tracks and hit any enemy player he collides with, making the ability much more consistent and fair to land. Hitting an enemy with Sword Slash gives the player a Weapon Charge (Max 3), that adds extra healing and damage to the next Retribution, negating some of the damage the player might have taken during that time. This allows the player to stay on target longer and conveys a pretty straightforward goal of how to play Raigon. Sword Slash hits also reduces the cooldown of Retribution. 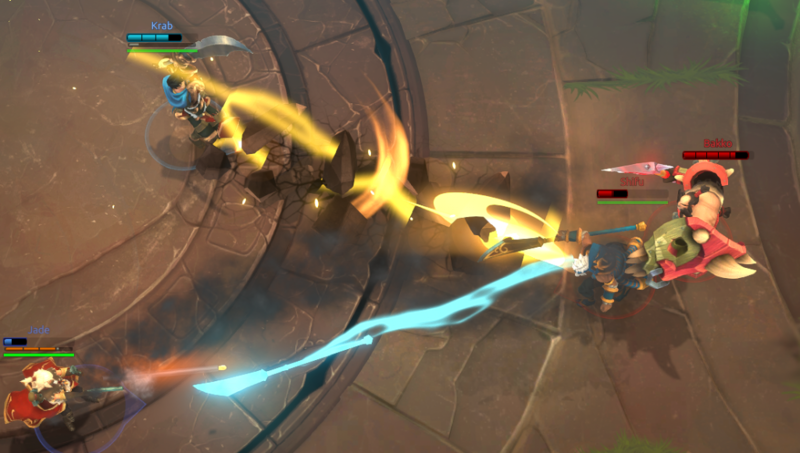 This makes sure that every time a player gets three Weapon Charges, they can use Retribution, whilst limiting the amount of times they can use Retribution to dodge enemy abilities. 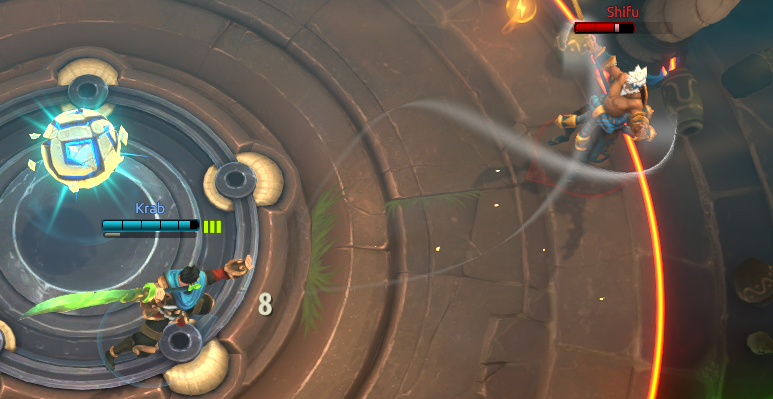 The mechanic of Weapon Charges can also be found on both Bakko and Shifu, which connects to what I was talking about earlier with teaching common mechanics. However, combined with the cooldown reduction of Sword Slash and the movement dash of Retribution, how the player decides to use the ability in different situations is what makes it unique. 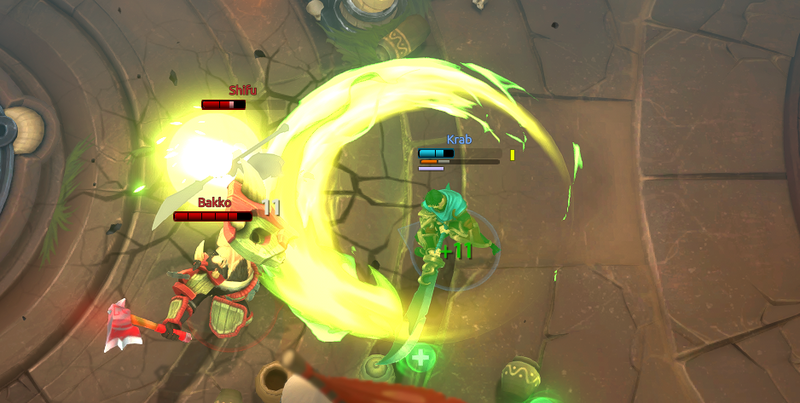 Raigon using his Retribution ability, dealing damage to his enemies while healing himself. Parry was perhaps our greatest flirt with Reaver from BLC, who had a similar ability. It started out as a movable “Counter” type ability that fired a projectile that would inflict incapacitate towards the target that striked him. At the risk of making the champion less beginner friendly, we decided after playtesting on the current aim-based reflect, since it was more satisfying to land and allowed for interesting and dynamic play. The essence of what now sits as the Ultimate in Raigon’s Ability kit, Wrath of the Tiger, was at one point his “E” ability. It functioned kind of like Poloma’s Ghost Wolf ability, but with Raigon bouncing and slashing targets that were close to each other. While the concept of “hitting once, bouncing several times” is easy enough to understand and would go well in hand with our direction, questions like “Where should he land?” presented problems. Multiple players could walk in and out of range or use a “Counter” ability, making it hard to figure out where Raigon would land and plan for your next move. If the landing spot would be too obvious, like say, where you started the attack, you would eventually be predicted by your enemies, i.e immediately find yourself landing in all of the enemy attacks at once. Whilst abilities that are easy to punish can create an interesting risk vs reward kind of situation this type of interaction didn’t really fit Raigon. The idea of a stronger CC (short for “Crowd Control”) ability on a melee champion is something we have discussed before and piqued our interest this time around. Most melee champions in Battlerite lack strong CC options in their core kits (Core kit meaning without Battlerites or spending energy), and so the idea of Seismic Shock took form. Seismic Shock proved to be a great centerpiece. An ability that ties the whole kit together. It works as a tool for switching targets by putting an enemy out of combat for a while or a disable to relieve your ally of some pressure. If you are on the offense, combining Seismic Shock with a neatly timed Heavenly Strike for example serves as a both flashy and deadly combo! With these abilities defined, we now had a very interesting core kit to work with. Seismic Shock allowed the player to set up combos with “Heavenly Strike” or “Retribution” which also had a visual flair that tied in with our direction of broad appeal. Up to this point us designers had been working on Raigon with placeholder animations, models, VFX and SFX. Raigon, visually, had basically been a weirder version of Croak that hurled people up in the air by swinging his blades, firing a fireball! One of my favourite things about working with champions is the art implementation, where we can truly see the character come to life with each new visual update. Imagine making Taya have Rook’s model and how much that would affect your view on the character as a whole! How a champion looks, feels and sounds are all very important parts of a champion. It affects both gameplay and the general perception of a champion. Gameplay-wise, a powerful ability needs to look powerful or else it will feel lackluster and unsatisfying to land. Matching the visuals with gameplay this way also helps players discern what is important to dodge or interrupt. Audiovisual clues helps us understand what is happening in the game and allows players to react faster. 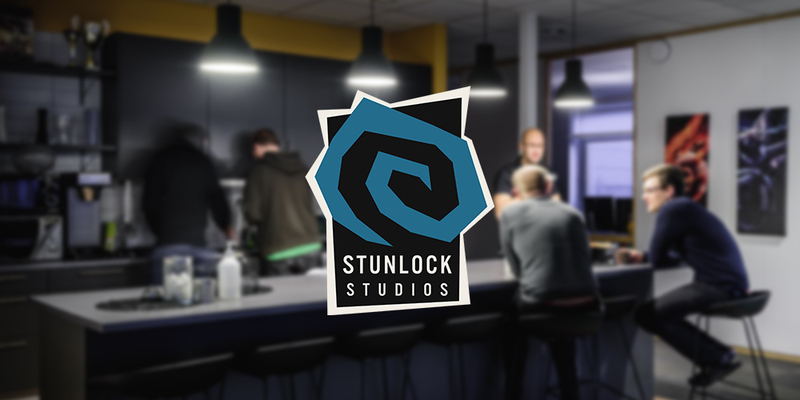 Our goal is to reduce the amount of stress a player is put under while actively searching for information on what is currently happening, so more focus can be put on their own strategies and counterplay. A perfect example of this is Jade’s Snipe, where we went as far as to draw out a vfx-line where Jade is currently aiming, combined with a distinct sound for when the ability is being cast, which is also heard during Stealth, opening up for counterplay. We are constantly trying to improve on how to tailor a coherent, interesting and practical experience for the players. With Raigon, we tried to up this a notch, while still being relatively mindful of the standards. Creating new champions provides a great opportunity to experiment with the existing formula, since you are in a way, starting fresh. Working on Dragon Palm, we tried adding a smoke trail between the affected player and the point of impact. This was a neat addition as it depicts, in the heat of the moment, the distance the target travels and might also help players learn about the distance of the knockback for future reference. 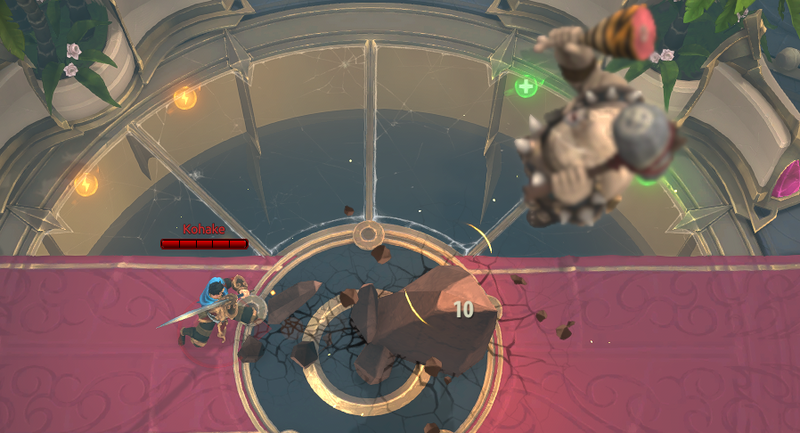 In addition to this, we added an animation that would represent the loss of footing, and as the animation transitions into another once the knockback ends, the player gets an indication when their champion is controllable again. It also went well with the flavor of the character! Another example is again Seismic Shock, that started out very basic as a CC but turned into almost a new type of CC, where the affected player can’t be attacked but are also unable to do anything for the duration. Getting struck by Seismic Shock also allows you to get a breathing room to plan for your retaliation, since you can’t stop it once you are hit. We experimented a lot with how to represent this behavior visually, and it resulted in how the affected player flies up into the air, how the camera follows and the animations/vfx involved. Basically we tried to make it feel grand and exciting to GET HIT, which seems counterproductive at first. However, I believe it helps to reduce frustration for the affected player, creating a visually intriguing spectacle, in addition to how the flight also serves as a visual queue for when Raigon should follow up with his next move to hit the landing player. Fellow Designer Kohake showing off. We are all really happy with how the visual design for Raigon turned out. We are constantly trying to improve upon things like visual feedback and quality. This, combined with our goal of creating a coherent experience, means you might see updates to existing champions in the future! Since this is the largest involvement I’ve had with a champion in Battlerite thus far, I must say that the creative process of creating a champion from start to finish with the rest of the team is something I thoroughly enjoy! I constantly find myself inspired and impressed by the rest of the team. Ideas and beliefs in each other’s abilities to meet our own expectations are treated with optimism and utmost respect. If anything, the hardest part lies in not being able to fit in all of our ideas without cluttering the champion. However, time spent prototyping and working on abilities that are scrapped are seldom wasted. Refined ideas and abilities that didn’t make the cut this time might, and probably will, turn up in one way or another later. The Stunlock Studios idea bank of “Killed Darlings” is an ever expanding treasure chest of interesting things to resurrect. If you have questions, please don’t be scared to ask. Drop your feedback on reddit and social media using the hashtag #BattleriteDevBlog so we can easily track it down. Have a great rest of the week and thanks for reading!